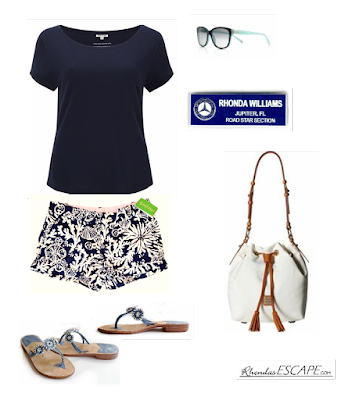 Rhonda's Escape: What to Wear To A Barbecue? This is an event that would have put me over the top a few years ago. OH NO - I can't do that. I have only a few casual items at that time and casual was not part of my gig. Rhonda was a "one trick pony". She could dress up, be professional/elegant and go out for the evening. A limited repertoire and confined by my own limits. Sound familiar? Even when going to work as Rhonda she was the forever professional and one dimensional. The real world is multi-dimensions. Rhonda needed to be real. She needed real experiences in the wild. E.g., shopping, getting her hair done, job interviewing, volunteering, Starbucks, going to the Post Office and taking walks at the beach. 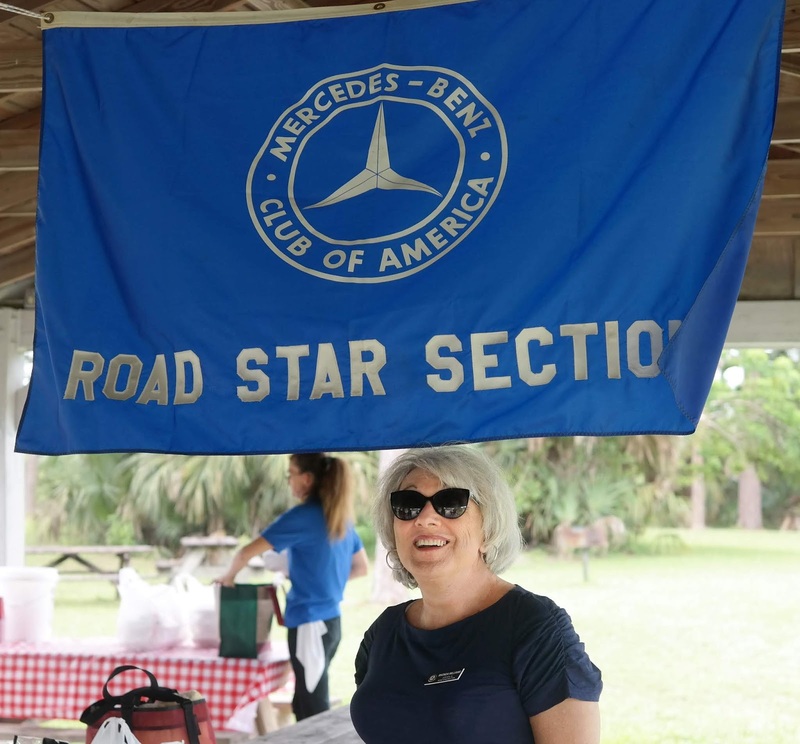 Just a few days ago Deborah at the blog Fabulous after 40 was ask the question “What to Wear to a Barbecue?” Perfect timing because my local Mercedes Club was having a barbecue the following Saturday; our end of season appreciation party. I have been perfectly comfortable at our holiday parties, and even casual car collection tours, but I was lost as to what to wear to a picnic/barbecue. This was going to be held outdoors at a local Florida State Park in the late spring - might as well be dead of summer any place else. My choice for the day - shorts, t-shirt, and sandals. What I see every day at the mall, Starbucks, and basically everywhere. South Florida is very casual. These were all item I have in my closet, however rarely or never wear. This was also going to be a good test for my upcoming "casual days and excursions" on a seven day cruise. How did the choices work out? Very well and yes there was trepidation on leaving home. 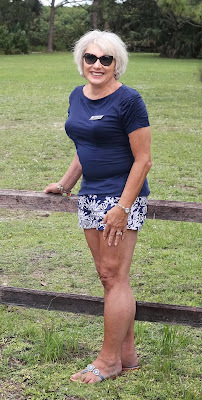 Once there I did receive several compliments and was asked: “where did you get those cute shorts?” The sandals were custom made at least four years ago and this was the first time wearing; a good match for the outfit. I like the way the outfit came together and most important, I felt confident. In spite of the humidity the hair even held it's shape. Thank you hair spray. The photo here was takes as I was leaving the event. When your shorts are colorful and busy, try to keep what you wear up top nice, clean and simple. This creates balance and lets your shorts take the spotlight. 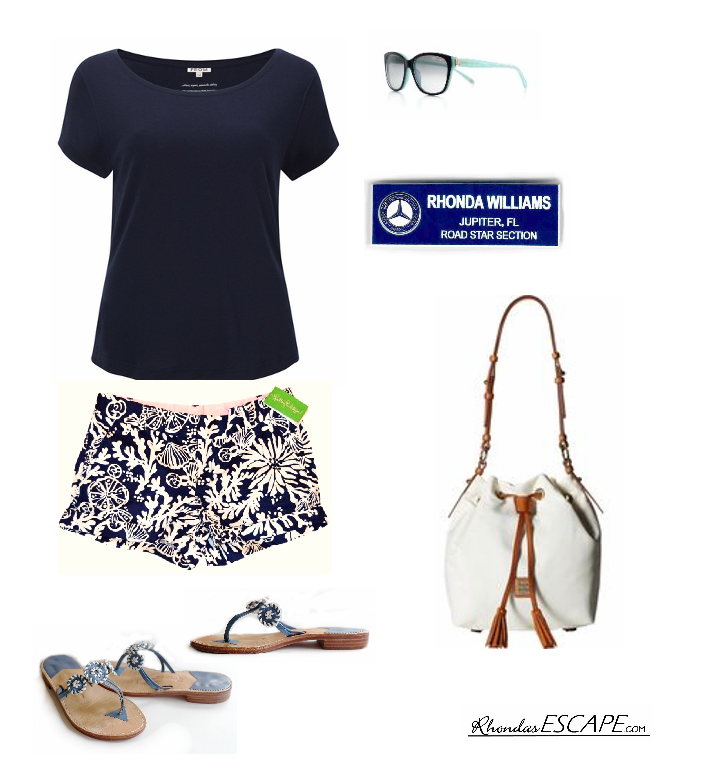 A fun hat also adds huge style to a casual shorts outfit, and earrings give you a more grown-up shorts look. Good advice for those of us a certain age, venturing out. Challenge yourself to be real and escape into the wilds of your feminine summer.